A hard worker, a goal threat and already a key part of his team: 1. FSV Mainz 05 striker Yoshinori Muto once again underlined on Matchday 14 just how well suited he is to the rigours of the Bundesliga. The 23-year-old scored his seventh goal of an already memorable season in Mainz’s 2-1 win over Eintracht Frankfurt in the first Rhine-Main derby of the campaign, but aside from finding the net on Saturday, it has been his overall contribution that makes him such a good fit for the club. There are a lot of players that don’t like contact with each other,” says Mainz coach Martin Schmidt, “but he isn’t one of them.” On the contrary, the Tokyo native has immersed himself in his new surroundings from day one and has already taken part in a celebratory ‘Humba’ with the fans. Playing with a smile on his face, he is also exhibiting his goalscoring ability on a regular basis. His seven goals are the second-highest of any Mainz player, as well as the fifth-highest in the league. Together with Yunus Malli - whose goal against Frankfurt was the 49,000th in the Bundesliga - Muto has been directly involved in 75 per cent of Mainz’s 20 goals, ensuring that the departure of Muto’s international team-mate Shinji Okazaki in the summer has had only a minimal impact. Indeed, it is another Japanese international and Bundesliga star with whom Muto is now drawing comparisons. Only one other player from the Land of the Rising Sun had previously managed seven goals after 14 matches of a Bundesliga campaign: Shinji Kagawa for Borussia Dortmund in 2010/11. Injury restricted Kagawa to just one more league goal that season, but Muto will hope there are many more to come. There is also the aforementioned Okazaki’s record of 15 goals in a Bundesliga season for a Japanese player to be beaten. 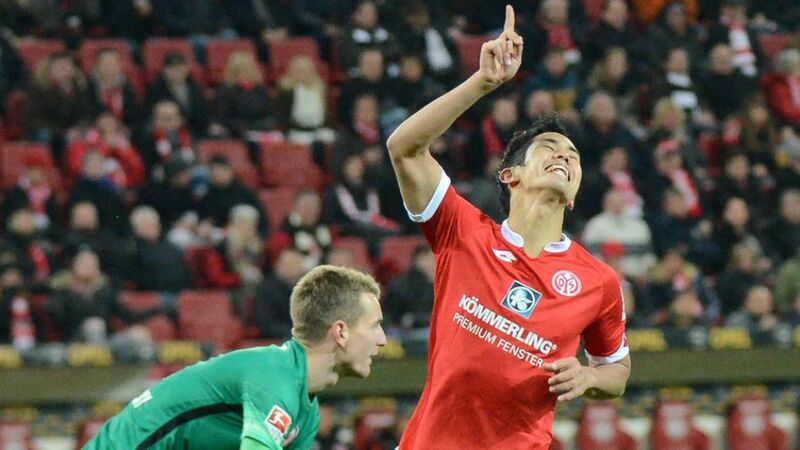 Muto has his work cut out, but Mainz’s ambitious new star from the Far East has already made the perfect start.